Founded in 1968 in the city of Campinas (SP), AETAL is a legally constituted association of evangelical institutions of theological education aimed at strengthening the formation of leaders for the Church of Christ. It affiliated institutions from Mexico to Argentina, covering the entire Latin American continent, with the exception of the Caribbean. One of AETAL’s strengths is the partnership environment it provides to its affiliates as they experience and consolidate the theological vision in the Kingdom of God. The AETAL board of directors, made up of representatives of affiliated institutions and elected at a general meeting, has a three-year term and is assisted by a secretary-general who specifically serves Hispanic institutions. AETAL has, in addition to the Fiscal Council, the Recognition Committee composed of five members representing affiliated institutions, which act in the evaluation of processes for the recognition of theological institutions; this commission is supported by a consultant from abroad (USA). It also has a Reference Framework with renowned personalities from the evangelical theological medium of Brazil, from other countries in Latin America and the United States, who act as Board of Directors advisors and support the activities of this association throughout the continent. All members are strongly committed to evangelical theological education. AETAL is linked to ICETE (International Council of Evangelical Theological Education – www.icete-edu.org), a global community composed of it and eight other continental associations of theological institutions that encourage collaboration, as well as promote interaction between which seek the development of evangelical theological education in the international context. Created in 1980, ICETE holds its important Global Theological Forum every three years, with the participation of all its member associations and their respective affiliates, under the auspices of the recognized World Evangelical Alliance – www.worldevangelicalalliance.com). 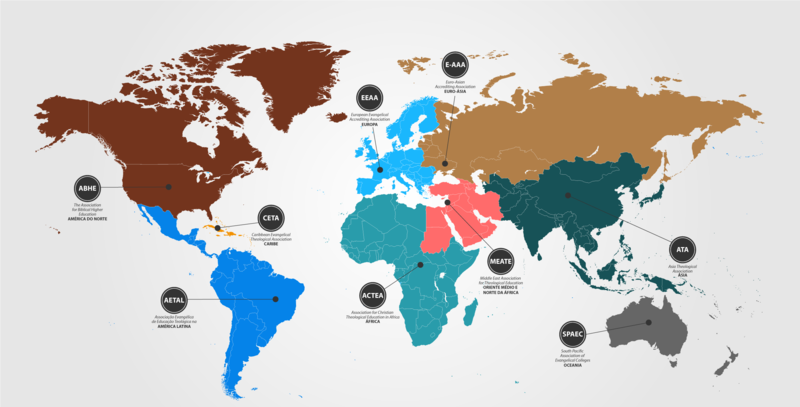 In current numbers, ICETE groups through its nine member associations almost 1,000 theological schools in 120 countries, totaling more than 110,000 students.